Edison, NJ – June 11, 2013 – Today,Majesco Entertainment Company (NASDAQ: COOL), an innovative provider of games for the mass market, along with Disney Interactive, debuted the premiere trailer for Phineas and Ferb: Quest for Cool Stuff. Watch Major Monogram showcase the latest in automotive technology as he features the boys’ newest ride, the A.T.T. (All-Terrain Transformatron). The upgradeable, ultra-cool amphibious A.T.T. is equipped with wall-scaling pincers, indestructible drills, and customizable colors. It’s a fun, out-of-this-world treasure-hunting adventure as the inventive stepbrothers enjoy their last week of summer. Meanwhile, Perry the Platypus, aka crime-fighting Agent P, isn’t fooled by competitors like Dr. Doofenshmirtz who plans on unleashing his evil horde of robot–inators to get rid of cool stuff in the Tri-State Area. Based on the top-rated Emmy Award-winning hit series, Phineas and Ferb: Quest for Cool Stuff is expected to release on the Xbox 360® video game and entertainment system from Microsoft, Wii U video game system, Wii™, Nintendo DS™ and Nintendo 3DS™ this August. 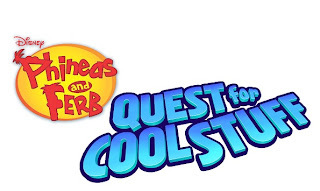 For more information on Phineas and Ferb: Quest for Cool Stuff, please visit www.QuestforCoolStuff.com. OMG!!! Awesome!!! My daughter is a Phineas & Ferb fanatic! I know what I am going to have to get besides school stuff this August!